Disclaimer: This is not a sponsored post. 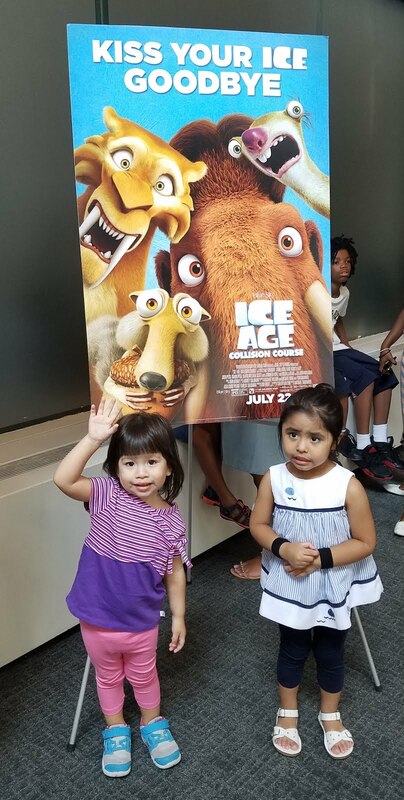 We were invited to attend a special screening of Ice Age Collision Course hosted by 20th Century Fox and the American Museum Of Natural History (museum portion of the event). All words and opinions expressed are 100% my own. Last week we had the chance to end our week with a big bang. We started our Friday morning with a special screening of Ice Age Collision Course which is now in theaters, so make sure to plan a fun family day and head to the movie theater with your family. It's also cool so you will definitely save on electricity for a few hours. 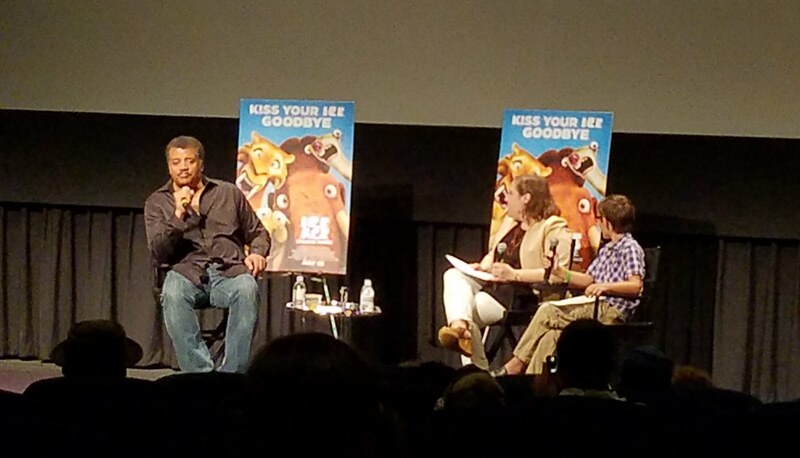 The icing on the cake was definitely the Q&A with mister Neil deGrasse Tyson himself. 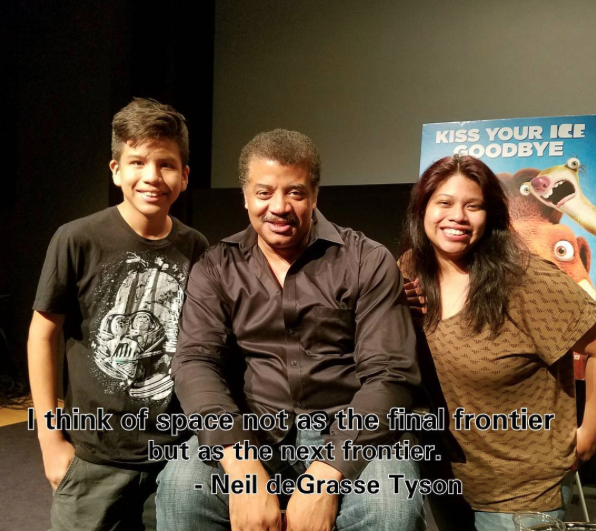 After watching the movie we were able to listen to him talk about what it's like to be an astrophysicist and what it feels like to love science so much. Listening to him speak was amazing and you could hear his passion for what he does in every word that came out of his mouth. Miguel was especially excited. 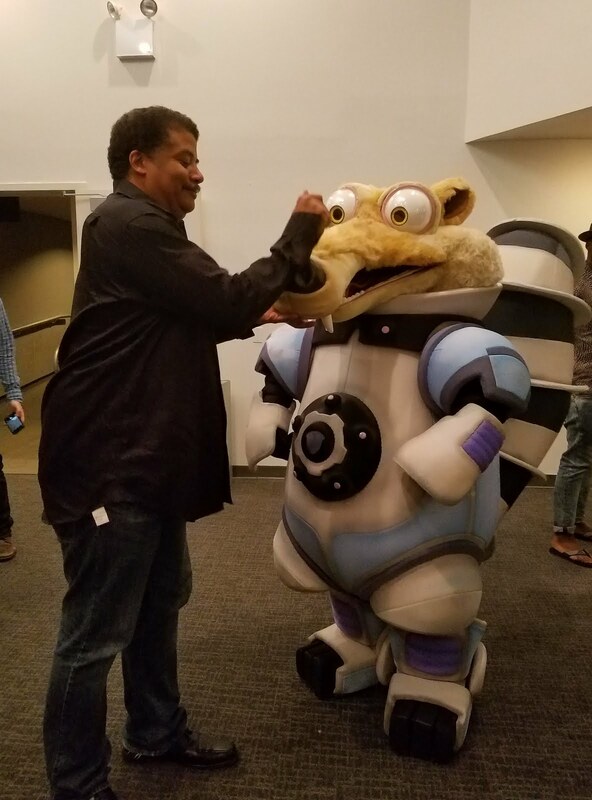 He's always loved science and space and we've always been big planetarium fanatics, so being able to meet the voice behind the space shows was just amazing. I love that Neil said that being a scientist is just a child who never grew up, they are curious about everything. They have questions about everything and everything sparks curiosity that is what being and astrophysicist is all about. Mr.Neil does voice over in the movie Ice Age as Neil deBuck Wiesel, this is not his first voice over and he's done a few that included a pig, but just in case you are wondering why he doesn't do more, it's because he always makes sure to take on projects that have some redeeming science value, no matter how little but there has to be some scientific meaning to it. It was great to listen to him clear up what asteroids really are, did you know that not all have craters and pits?! They are mostly huge rocks. He also shared some of his favorite things to do when he is not inside of the museum. Mr.Neil loves broadway shows and as a matter of fact if he lived another life in another lifetime he would write songs for broadway shows. How cool is that?! So many things were talked about during the interview but what really stuck to me, especially since we will be preparing for Miguel to get ready for High School. He will be entering 8th grade this year, that means applying for schools and not just any schools but what are supposed to be good rated schools. Mr.Neil mentions that it doesn't matter the school you go to, that doesn't make you or define you. What defines you is YOU! Always dream big and work towards making your dreams a reality, anything you set your heart to is possible, just believe in yourself. We left that room feeling happy and Miguel felt out of this moon, and with a new sense of belief. He truly believes with all his heart that will one day be whatever he sets his heart on, something science and space related for sure. After the great Q&A and a very yummy lunch we headed over to the American Museum Of Natural History to check out the new exhibit Dinosaurs Among Us. 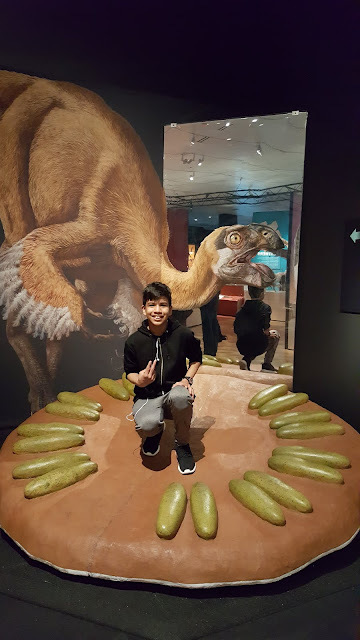 If you remember we are museum people and we were able to check out this exhibit back in April but the kids love dinosaurs and museums, therefor the museum was a must. What was more special about this museum visit was that we had a personal tour guide that guided us through some special exhibits and talked to us about special items that were located throughout the exhibit. We also got to check out the new space show. Even Valentina who is 2 years old loved looking up at the stars. 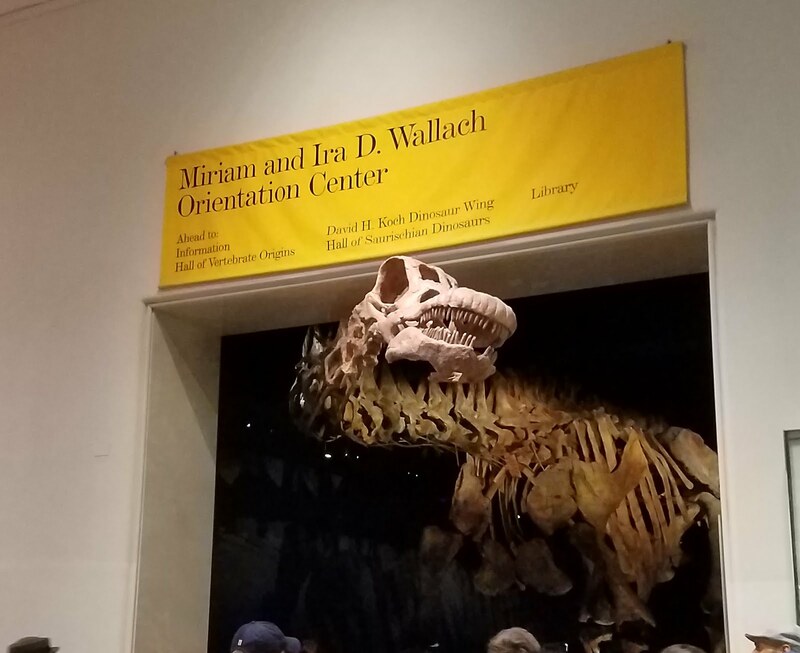 We ended the museum visit with being able to check out the newest dinosaur at the museum, The Titanosaur, it needs an entire room for himself and event then his head doesn't fit in it. You can see it peeking out in the first picture. It was a perfect day full of science, stars and dinosaurs. Definitely a great ending to a week. 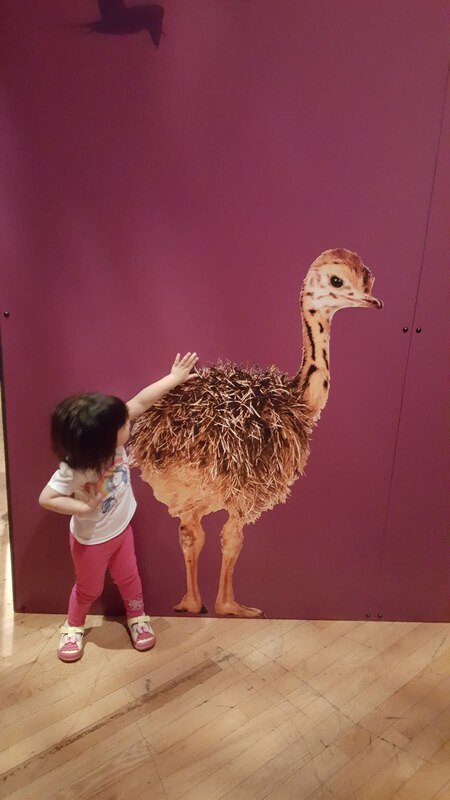 Make sure to check out the Dinosaurs Among Us exhibit, during this Summer break.